In compliance with the provisions pursuant to art. 13 D. Decree 30 June 2003, owner of the purpose, the MPT Unipersonale SRL, with registered offices at (36100) Vicenza, Via D. Meschinelli 90 and its operational headquarters in (36077) Altavilla Vicentina (VI), Via Retrone n. 2 / C, informs users of its website www.mpthitech.com the purposes and methods of the processing of personal data collected, their area of communication and spreading, as well as the nature of their conferring. This information is not collected to be associated with concern identified, but by their nature could, through processing and association with data held by third parties, allow users to be identified. This data category includes IP addresses or domain names of computers used connecting to the site, URI (Uniform Resource Identifier) of requested resources, the request time, the method used to submit the request to the server, the size of the file obtained in reply, the numerical code indicating the status of the reply given by the server (successful, error, …) and other parameters regarding the operating system and user computer environment. The data thus collected could be used to ascertain responsibility in the event of any computer crimes against the site. The optional, explicit and voluntary sending of data as required by the various sections of this site are used in order to fulfill the requests of the user (such as merely indicative exaple and not exhaustive: when requesting information or clarification by calling the numbers listed on the site or by writing to the e-mail addresses therein). Any specific information summaries are reported or displayed in the pages of the Site dedicated to on-demand services, so as to draw the attention of the processing of their personal data. With the exception of navigation data necessary to carry on the computer and data protocols, the provision of the personal data by the user is free and optional. However, failure of the data will make it impossible to proceed to requests made or that user want to forward. The data processing is carried out using paper and computer media. The data are stored in paper and electronic with the adoption of the minimum security measures provided for by the legislature. The use of C.D. Session cookies (which are not stored permanently on the user’s computer and disappear when the browser is closed) is strictly limited to transmitting session identifiers (consisting of random numbers generated by the server) necessary to enable a safe and efficient web exploration. The C.D. Session cookies used in this site avoid the use of other technologies that could compromise the privacy of user’s browsing and do not allow the acquisition of personal identification data. The data collected will not be distributed, sold or exchanged with third parties without the express consent of the person concerned, unless any communications to third parties authorized – committed to confidentiality or if charge of data processing art. 29 of Legislative Decree no. 196/2003- (such as computer support company) where necessary in order to provide the requested service. The data may also be communicated to the competent authorities, in accordance with the terms of the law. e) the subjects or categories of subjects to whom the personal data may be communicated or who can learn about them as appointed representative in the State, managers or in charge of. The Owner is the M.P.T. 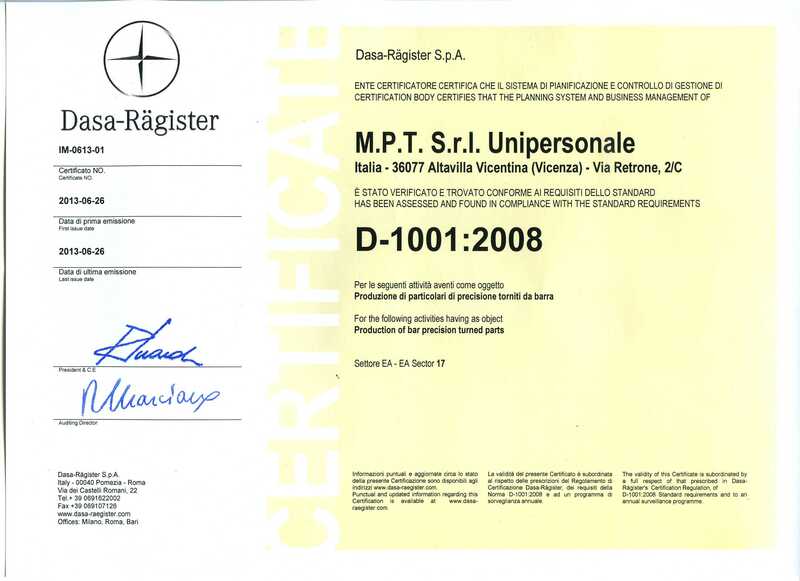 Unipersonale SRL, with registered offices at (36100) Vicenza, Via D. Meschinelli 90 and its operational headquarters in (36077) Altavilla Vicentina (VI), Via Retrone n. 2 / C, Italy.